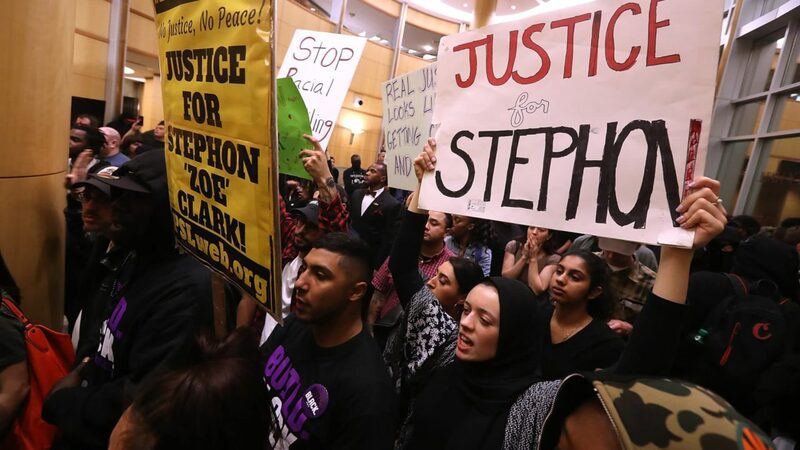 Activists in Sacramento, Calif. are not backing down in their fight for justice for Stephon Clark, an unarmed Black man who was killed by local police last year, disrupting a city council meeting after more than 80 protesters were arrested following a demonstration on Monday. According to CBS News, several speakers at Wednesday’s council meeting were furious over the arrests, which followed protests over the decision to not bring criminal charges against the officers involved in Clark’s shooting death. The report notes that tensions came to a head when a speaker, identified as Alexander Clark told Mayor Darrell Steinberg to “shut the f–k up” and declined to return to the crowd after going over his allotted speaking time. “They don’t give a f–k about Stephon Clark,” he yelled before jumping on the podium. Steinberg called a recess at that point saying that the meeting would continue when “things calm down” and council members left the chambers, leaving faith leaders to work to calm the situation. According to KCRA, Rev. Kevin Ross with Unity of Sacramento worked with police to help people settle down so that the meeting could continue. The officer told Ross that police would go to the other side of the room if the audience returned to their seats. After about 15 minutes, the meeting resumed. Steinberg tweeted on Monday that he was disappointed that Monday’s protest ended with arrests. He and the city council members have since called for an independent investigation into arrests, where at least three clergy members and a Sacramento Bee reporter who was covering the demonstration were also taken into custody. Speakers accused police of being aggressive, pushing and even sometimes striking out at protestors, CBS notes. Ross also claimed that officers trapped some people who were trying to disperse, as ordered. Clark’s family has also filed a wrongful death lawsuit seeking more than $20 million, accusing the city of not properly training its officers in the use of deadly force, and accusing the officers involved of using deadly force for no reason.